The purpose of the Arkansas Tennis Patrons’ Foundation is to establish, maintain and operate a non-profit, benevolent and educational organization. The Foundation shall promote tennis for juniors and adults in cooperation with the Arkansas Tennis Association. The first known tennis activity in Arkansas occurred in 1902 when Henry Doyle and a friend put together a makeshift tennis court and began hitting balls. In the early 1900s, the growth of tennis was slow and the few courts that were built were privately owned. Club tennis came to Arkansas in 1902 when the Country Club of Little Rock opened their new clubhouse, new golf course, and a single tennis court. By the mid-1930s and early 1940s, more Arkansas began to play tennis, including Jay Freeman and George Dunklin. These gentlemen were the first two players to go out of state to play in both national and international events. In 1956, Pat M. Riley, Sr. saw the need to form a "tennis organization". He did so, becoming the first President of the Arkansas Tennis Association. The only tennis tournament in the state at this time was an event for men's singles and doubles held once a year at the Country Club of Little Rock. Using his own private office as the first operating office, Mr. Riley organized the ATA and created by-laws for the Association. Over the next several years, the first woman's state tournament, the first age group tournaments, and the first junior tournaments were started. Throughout the 1960s, tennis continued to grow. In Little Rock six public courts were built at the Walker Tennis Center, six courts were added to the Country Club of Little Rock, several courts were built at the Riverdale Club. In 1970, Dr. Ted Bailey was persuaded to become the ATA President. Dr. Bailey and his wife, Virginia, provided a small office for the Arkansas Tennis Association along with the first secretary, Mary Jane Koch. With the Arkansas Tennis Association now developed, having an office, a secretary and by-laws, Dr. Bailey and others decided it was time to form the Arkansas Tennis Patrons Foundation. The mission was to establish, maintain and operate a nonprofit organization for the purpose of promoting tennis in the state of Arkansas in cooperation with the Arkansas Tennis Association. Through the tireless efforts of Dr. Bailey and the founding trustees, numerous Patrons were recruited and their contributions were then used to support the Arkansas Tennis Association. With this money, the ATA became a year-round operation and has remained so. These early Patrons were true pioneers, most of whom played tennis, enjoyed tennis and wanted to see the sport grow in the state of Arkansas. It is important to understand that the Arkansas Tennis Patrons Foundation and the Arkansas Tennis Association while sharing many of the same goals, are separate entities. The Patrons have and will continue to support the Arkansas Tennis Association in its mission to grow tennis. 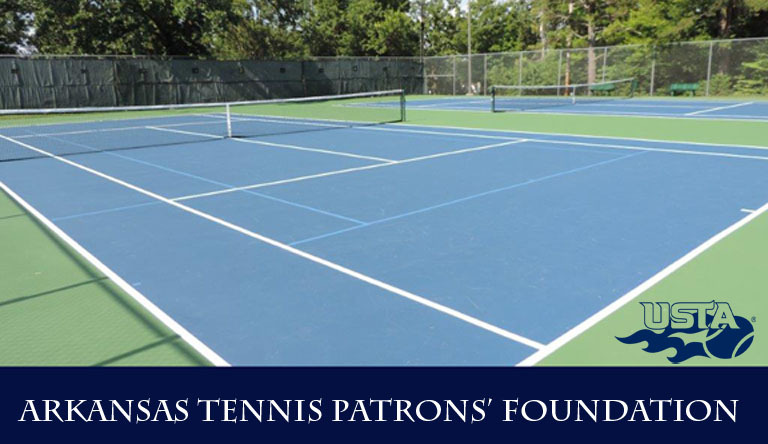 The largest example of this aid was the decision made by the Patrons to support the Burns Park Tennis Center expansion in conjunction with the City of North Little Rock. Five hundred thousand dollars were raised for this project with the number of Patrons increasing from fifty to seventy-four. The Arkansas Tennis Patrons Foundation continues to support junior tennis through scholarships and program support as well as improve statewide tennis facilities through its facility grants.